This photo, taken in about 1900, looks from the brook towards the centre of Worthen; in the background the rectory is on the right and the group of black and white cottages on the left. Other photos, together with my comment, gives details about both these places. 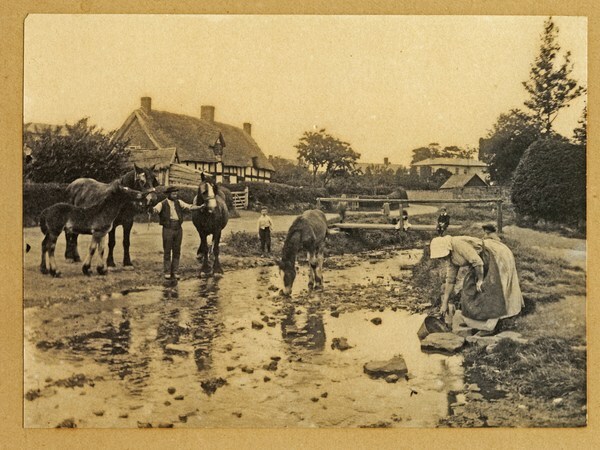 In the foreground is Elizabeth Gornall, taking water from the brook. She lived in the row of cottages to the right of the stream, out of camera shot, with her husband Arthur Gornall, a self employed house painter. At this time they were both in their early 60s. I don't know who any of the other people are. Photo made available by Lawrence Blakemore.